(MissionNewswire) Salesian missionaries in Samoa are providing education and technical skills training to help disadvantaged youth find and retain employment. Two Salesian schools, the Don Bosco Technical Center in Alafua and the Don Bosco High School/Vocational Center at Salelologa, provide educational opportunities for students whose parents are unable to provide financial assistance for their education. 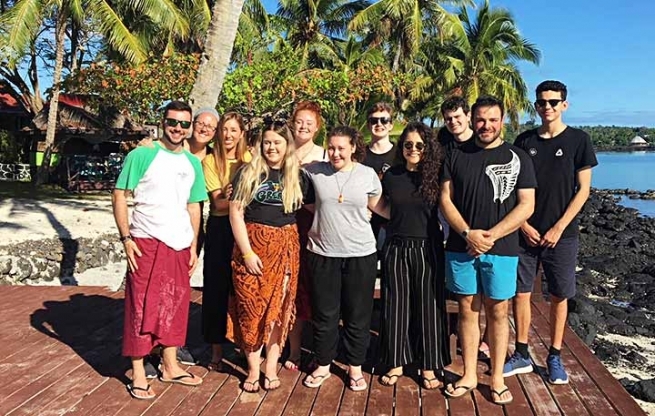 Recently, a group of young Australians representing the Cagliero Project and the Salesians of Don Bosco in Australia visited Samoa to work directly with local programs. The Cagliero Project is an immersion program that runs once a year and sends volunteers for six to 12 months to give younger Salesian youth an opportunity to experience a different culture and understand what the life of a missionary might be like. Don Bosco Technical Center in Alafua was established in 1998 and currently has 245 students – all young men from Samoa and Tokelau. Students have the opportunity to choose from general or specialized trade training. The technical training is complemented by courses in Samoan and English, mathematics, technical drawing, computer studies and religion. In addition, the center promotes personal, moral and spiritual growth, skills leadership development and teamwork through cultural and sporting activities. The students at Don Bosco Technical Center learn skills that are in demand in Samoa. Upon graduation, many secure work almost immediately which is a significant achievement in a country with high unemployment. The Don Bosco High School/Vocational Center at Salelologa is now in its eighth year and has more than 300 students. Many come from remote villages on a school bus made available through the school. The center offers an integrated curriculum with academic and technical subjects designed to provide students with employment and human relations skills as well as self-reliance. Salesian missionaries are looking at how they can better incorporate outdoor education, including games and sport, into the overall program. In November 2016, a new facility, Father Elio Proietto’s Hall, was officially opened after receiving funds from the Salesian Rector Major, the Don Bosco Mission in Turin, Italy and Salesian Missions, Madrid, Spain. The local school community also came together to host a fundraising walk around the island of Savai’i. With this additional facility, Don Bosco Salelologa continues to serve as an important center of education, meetings, conferences, youth gatherings and sport on the island of Savai’i. Samoa boasts one of the most stable and healthy economies in the Pacific region, according to the World Bank. The poverty rate, once just over 26 percent, has dropped closer to 20 percent as the country strives to meet the UN Millennium Development Goals, a blueprint driving efforts to meet the needs of the world’s poorest. Although Samoa has made impressive progress in social development, many rural communities in the country grapple with an unequal distribution of wealth and benefits. Poorer communities in remote parts of the islands are particularly vulnerable, especially in areas most likely to be affected by cyclones or other natural disasters. Gender inequality is apparent as women strive and often fail to find the same work and income opportunities as men and youth find it increasingly difficult to find livable wage employment in the country.